Gomez Addams (voiced by John Astin, reprising his role from the 1960s TV series) – The patriarch of the family and the younger brother of Fester. He is a caring and enthusiastic father and is deeply in love with his wife, Morticia. As a running gag, he becomes excited and romantic whenever she (or he himself) speaks in a foreign language (usually French) or mentions violence or misery. He usually spends his time with unusual activities in the home, mostly accompanied by Fester. Gomez is usually seen wearing a pink suit, unlike his other various incarnations. Morticia Frump Addams (voiced by Nancy Linari) – The matriarch of the family. Like her husband, she is very much involved with the raising of her children, and returns the amorous attention she receives from her husband. Her hobbies include art and taking care of the plants. She can be described as a vamp and is commonly seen wearing black gothic dresses. Gomez's nickname for Morticia is Tish. Morticia's catchphrase is, "Oh, Gomez." Lurch (voiced by Jim Cummings) – The blue-skinned butler of the Addams family. He is very tall and strong, which intimidates most guests, although he is in fact sweet. He almost never speaks, and usually responds by mumbling in a deep voice. His catchphrase is "No comment", uttered when witnessing or becoming part of the antics of the rest of the family. Lurch is one of Wednesday's best friends. Aunt Noggin - A two-headed woman, with one head being Black and the other head being Caucasian. They are the family's friendly aunts. They wear an old Victorian dress. Norman Normanmeyer (voiced by Rob Paulsen) - The Addams' neighbor. The opposite of the Addams in almost every way, he is often outraged by their unusual activities and tries to sabotage most of their plans. Despite his contempt of the Addams family, Norman's obsession with underwear (he has his home festooned with underwear) makes him just as abnormal as the Addams clan. Normanmeyer wears a blue suit, has a bit of a pot belly, and is the CEO of an underwear company called "Normanwear". Uncle Fester is fond of Norman and thinks that he's his best friend. Uncle Fester's nickname for Norman is "Norm". Norman is also on the Happydale Heights City Council. In "Festerman," it is shown that Normanmeyer has a superhero counterpart named Underman in the Festerman comics. Uncle Fester creates a new fabric called Happyester, so he and Gomez decide to present it to Norman Normanmeyer, who runs Normanwear. Normanmeyer is enthusiastic to buy the formula and offers Uncle Fester to be his partner, but Uncle Fester makes unusual demands before he signs the contract. Meanwhile, a rival underwear company RumpCo has sent a spy, Underwear Hitman "Fingers", to steal the formula. After Wednesday and Pugsley save the day, Uncle Fester is happy to sign the contract. To Uncle Fester, Wednesday, Pugsley, and Thing's surprise, they are thrown out of Normanwear. Nevertheless, Uncle Fester misinterprets the action as a friendly deed. Later, it turns out Happyester has itchy side effects, something that delights the Addams, but causes bad publicity for Normanwear causing Uncle Fester to support Normanmeyer. Wednesday and Pugsley's bad mood over the sunny weather is worsened when they are assigned for a school project called 'creative problem solving through junior career exploration'. Through the enthusiasm of Gomez, it is decided that they turn the Addams home into a "dead and breakfast." Wednesday and Pugsley are reluctant to start the project, but do not want to let down their parents. After the hotel's opening, the trouble starts. Not only are the Normanmeyers determined to ruin their business and do the Addams receive a visit from a health inspector, who is courted by Granny, they also have a guest, Mrs. Quaint, that sets her eyes on the family fortune. Wednesday and Pugsley eventually use booby traps to capture Mrs. Quaint thereby solving a problem creatively. Feeling that he has done everything once, Gomez goes through his days uninspired. Morticia reminds him that everything in his life has been a success, and encourages him to fail at something. The plan backfires, though, because everything Gomez does results in a profit, earning a fortune in only six hours. Mr. Normanmeyer offers Gomez his ticket to failure, announcing his plans on using his land to complete a new freeway. Some time after signing the contract, the family is surprised to find out that part of the contract was demolishing the mansion with bulldozers. Although Gomez sees it as a friendly deed of Normanmeyer, he stops him, revealing that the house is built on a swamp and could therefore not be used for a freeway. Instead, the freeway is built on the Normanmeyer's land, much to their frustration. Meanwhile, Morticia reminds Gomez that he has failed in failing, and therefore succeeded in his plans. The family notices that Lurch has been somewhere else with his attention lately. Wednesday, Pugsley and Thing dig through his room and find out he has recently been dumped by his girlfriend. Fester building him a new girlfriend seems the perfect resolution. Lurch shows no interest in the robot, though, so Wednesday calls his ex-girlfriend to reunite with him. Meanwhile, Cousin Itt has fallen in love with the robot and they run off. Wednesday is fed up with her brother continuously ruining her paintings. She decides to create an improved Pugsley with her mother's living paint, but every creation she makes ranging from an intelligent Pugsley, a stronger Pugsley, and a female Pugsley prove to be too annoying. With the help of the real Pugsley, she exterminates the alternative Pugsleys and admits that her brother is perfect. The Spy Twins take a break from spying and try to break into the Addams safe which is guarded by Thing. They dress up as a giant hand to seduce and distract Thing, and thereby catch him. Thing is able to escape and eventually scares away The Spy Twins. N.J. feels embarrassed by his parents' weekly speeches at school about underwear. He is too afraid to admit that he does not want to take over his father's business one day, and instead of confronting his parents, he runs away from home. After explaining the Addams residence is the one place where he can be himself, Wednesday and Pugsley allow him to stay in a spare room. They make him look unrecognizable and introduce him as Mumbles Addams, a long lost cousin, at a family reunion organized by Gomez and Morticia. N.J. is initially delighted with the attention he is receiving, but soon finds out the relatives are too odd for his taste when they fight over whose side of the family Mumbles is from. During a burst out, he upsets Uncle Frankus, an intimidating relative who soon starts chasing them. After he is saved by Wednesday and Pugsley, N.J. is informed that it is all right to be different or not live up to people's expectations. N.J. has the courage to return home and his parents, who were worried because of his disappearance, announce that they will be less hard on him in the future. We see a sad and unhappy Thing who is bored and wants to become a star. He doesn't play with the children nor help Uncle Fester in the absence of Gomez and Morticia as they had left for yet another honeymoon, Wednesday tries to help Thing and Granny predicts fame and fortune and accompanies Thing to Hollywood where his talents bring a lot of fame, Granny misses family and leaves to home after this his newfound fame also attracts a jealous maniac named Harry Palmer who lost his chance and fame thanks to Thing and tries to capture him. But Thing manages to capture Harry Palmer. Afterwards, he tells the reporters that he won't do any more films and returns home. Wednesday and Pugsley plan to go with Cousin Itt on his latest missions. The Spy Twins make various attempts to capture Cousin Itt which always tend to go wrong with the other Addams Family members thwarting their plans. Uncle Fester writes in his diary about his day. The Addams Family's Annual Family Joust has arrived and every year, Wednesday always beats Pugsley in the joust. Gomez and Uncle Fester give Pugsley some pointers in order to beat Wednesday in the joust. Uncle Fester reads his comic book called "Festerman" to Wednesday. The plot of the comic details Festerman's experiment to get more power resulted in his former partner Underman (Norman Normanmeyer's comic counterpart) emerging from another dimension and wanting revenge on Festerman after Fester Anvil fell on him. Morticia has lost her artistic touch. So Lurch and Thing help Morticia get her artistic touch back through whatever way possible. Gomez and Morticia are delighted by Granny's Halloween tale, which events took place forty years ago. Grandmama talks about a man who went golfing on Halloween night, and was struck by lightning, which lost him his head. He then re-appeared as the Puttergeist: a mean man with a huge golf ball for a head who scares the town at night. Wednesday and Pugsley don't believe in the Puttergeist and go trick and treating with Thing and N.J. When Wednesday uncovers Uncle Fester as a Puttergeist impostor, her remaining doubts are confirmed: Puttergeist does not exist. So when the real Puttergeist shows up, attempting to scare and capture her, she is not feeling scared. While escaping with a golf car, it is revealed that Mr. Normanmeyer is the Puttergeist. He explains that the myth was started by his grandfather. N.J. is initially upset that the Puttergeist is not real, but he appreciates that his father continued the act for so long, just to please him. Moments later, the real Puttergeist drives along, confirming his existence. 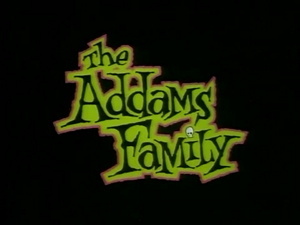 The Addams Family start their own television channel which the Normanmeyers plan to ruin. Uncle Fester suddenly grows hair on his head and no barber-based tools can remove it since the hair is hard. The other family members work to find a way to remove the hair from Uncle Fester's head. When a latest attempt to remove hair from Uncle Fester with a hair removal formula seemingly causes the demise of Cousin Itt, Norman Normanmeyer sees this on his FesterCam and has Uncle Fester arrested for the murder of Cousin Itt. While Uncle Fester deals with his tough inmates, Wednesday and Pugsley end up figuring out what actually happened to Cousin Itt when the supposed hair-removal formula doesn't work on Pugsley. Wednesday, Pugsley, and Thing find the trail to Cousin Itt leading them to a hideaway beneath a local donut shop. Gomez, Morticia, Norman, and Normina visit Uncle Fester in jail who has become friends with his inmates after blowing himself up. Norman is upset to find out that Uncle Fester loves being in jail. Just then, Wednesday, Pugsley, and Thing arrive with Cousin Itt (who actually had to leave for an important mission at the last minute). Uncle Fester is released from prison and thanks Cousin Itt. Norman is stopped by a police officer who asks Norman if he actually witnessed the crime. Norman is thrown in jail for lying to the police and ends up at the mercy of the inmates. Back at the Addams House, Uncle Fester loses his hair from the worrying and the Addams Family celebrates this. Gomez and Uncle Fester find the Hiding Horn in the attic and play Hide and Seek with Lurch where Lurch would have to find them before midnight. Yet Lurch keeps finding Gomez and Uncle Fester. The Spy Twins kidnap Wednesday and Pugsley in order to use them as bait for Cousin Itt at their swamp hideout at the Addams Family's summer cottage. Yet Wednesday and Pugsley end up outwitting the Spy Twins where they keep getting attacked by Snappy. When Gomez is relaxing, Thing wants him to sword fight. So Gomez tries to find other ways to relax with Thing still wanting to have a sword fight with Gomez. Morticia is sad that Wednesday and Pugsley prefer to spend their time with friends or other relatives, rather than with her. Morticia does her teaching abilities until it creeps out the teachers enough for Principal Macnamara to let her go. Upon being rehired by Principal Macnamara, Morticia decides to become more active with their school activities when the teacher in charge of it gets sick. Morticia organizes a scavenger hunt at the Addams residence. Normina Normanmeyer tries to prevent the children from going to the Addams house. Out of concern for the children's safety Normina tries to sabotage the hunt to prove the Addams house isn't safe for children and ban Morticia from further school activities forever. Her plan of destruction turns out to backfire though upon trying to use Uncle Fester's Plant Growth Formula on a plant making Morticia only more beloved with Wednesday and Pugsley's classmates. Granny's sight has been blurry and Morticia insists that she get some glasses. Granny stubbornly refuses to wear glasses. Soon, Granny accidentally uses Uncle Fester's Growth Spray that causes Thing to grow to 20 ft. After Cousin Itt saves the day, Granny eventually realizes that wearing glasses isn't bad after all. Before heading to sleep, Wednesday reads her version of Little Bad Riding Hood to Pugsley where Wednesday is Little Bad Riding Hood, Thing as Littler Red Riding Hand, and Pugsley is the Big Bad Wolf. Pugsley and Thing plan to use a formula to turn Wednesday into a dog. However, each attempt to transform Wednesday into a dog ends up turning her into different animals. Gomez persuades Morticia to hold a gallery showing of her best artworks as part of a charity art show at Wednesday and Pugsley's school. While Norman Normanmeyer stays by his phone awaiting a call for an important client, Normina plans to find a way to sabotage Morticia's art show. The Addams Family discovers that Lurch is troubled. Wednesday, Pugsley, and Thing learn that Lurch wants to be a cowboy. While Lurch is taking some time off to be a cowboy, Uncle Fester ends up covering for Lurch. Wednesday, Pugsley, and Thing go with Lurch to a local range where the local foreman named Buck plans to see to it that Lurch fails the cowboy training even to the point where Buck calls in Biggis the Barn Kid. Even though Lurch is offered to become the new foreman, Lurch eventually returns to The Addams Family house since he's homesick. Wednesday and Pugsley tells Uncle Fester a story about Jack and Jill (portrayed by Wednesday and Pugsley) who end up getting magic beans from the Big Bad Wolf. The beans end up growing into a beanstalk where they end up encountering a giant (portrayed by Norman Normanmeyer). Following a rejection slip from a comic company, Uncle Fester reads his latest comic called "Festerman Returns" to Wednesday and Thing. The plot of the comic details Festerman learning that his fellow comrades in the Fester League have gone missing. Festerman discovers that Mega Fingers is behind this upon infiltrating the Fester League disguised as Fester Gator. A female mail carrier who has gone against the mail carrier delivery challenges ends up having some problems when it comes to Thing who wants to help her deliver The Addams Family's mail. Much to Wednesday's frustration, Pugsley is abandoning their constant terrorizing each other because he has fallen in love with Shella, the school's most popular girl. Although disgusted by his soft behavior, Wednesday decides to help him out to court the foreign girl. She motivates him in to talk to her at school, and is annoyed that Shella shows no interest in him. 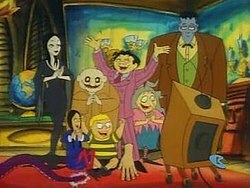 Pugsley thinks that he can attract her attention if he is like everyone else, and drinks a normalizing formula, much to the Addams Family's shock. Distancing himself from his unusual family, Pugsley takes an interest in Norman Normanmeyer who unlike the Addams is delighted with Pugsley's new behavior. In school, he becomes a geek and is tortured by the school bully Mortimer as a result. When Mortimer is about to fight with Shella for defending Pugsley, the formula has spent its force and the real Pugsley takes revenge on him. Shella is romanced by Pugsley, but announces she has to return to her homeland soon. He and Wednesday are nevertheless happy, because their lives are now back to 'normal' and Pugsley learns that it's better to be himself. The Addams Family watch a video of Cousin Itt's mission against Ian Thundermane. Gomez and Morticia go on a spy-themed honeymoon to Spain when Ian Thundermane has escaped from prison. While Gomez and Morticia are out on their honeymoon, Ian Thundermane ends up capturing the other Addams Family members and the Normanmeyers as part of his revenge on Cousin Itt. Now it's up to Gomez and Morticia to rescue Cousin Itt and defeat Ian Thundermane. Granny has lost her psychic abilities and must return to Crystal Rock in order to get them back. Wednesday and Pugsley enter a disguised Thing into the Watch-Pets Competition where the pets are stolen by Harry Palmer in a plot to get revenge on Thing. Uncle Fester sings about his life with the Addams Family. Wednesday and Pugsley attend a summer camp where they are placed in Camp Holler run by D.I. Holler instead of Camp Holly. Wednesday's doll Marie is presumed to have burned in the fireplace and Lurch offers to serve as the doll in its place. Norman and Normina sing a blues song explaining to N.J. why they hate the Addams Family. Episode ends with a harmonica solo playing over the credits, in a sort of parody of Roseanne. Wednesday is thrilled when she wins a competition to have horror-themed TV host Graveyard Gary visit her home. Gomez is supportive, but worries that Wednesday is more inspired by Gary than him. Pugsley is the only one of the family who hasn't mastered his own dance and Thing decides to help him. Granny hosts her own question show.